This article describes the order in which the 12 tribes of Israel were organised, whenever the whole nation was to set up camp. In the centre of the camp was the Tent of Meeting [also called the Lord’s Tabernacle] with 3 of the tribes of Israel encamped on each side. 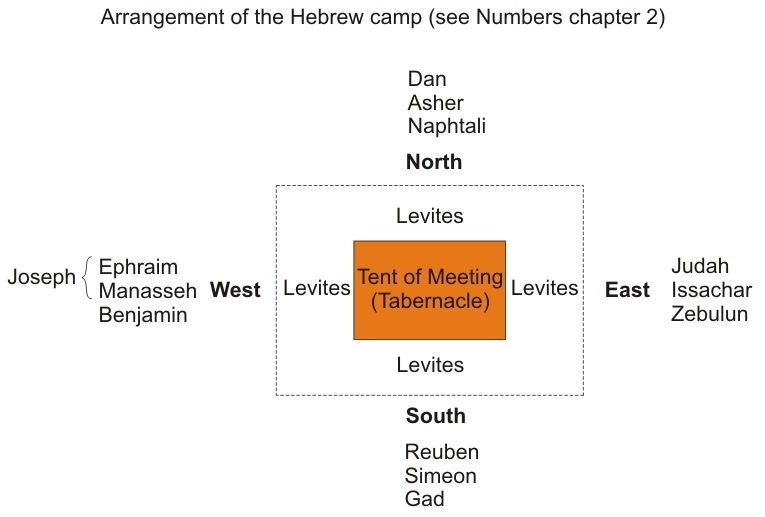 The Levites were the only tribe that was allowed to camp any closer to the Tent of Meeting. Clearly, from this text we see that each tribe, & probably each family had its own banner. There is no description in the Bible of what these tribal or family banners looked like. However, I thought it would be visually appealing to design 12 distinctive tribal banners (one for each son of Jacob), for my cartoons. ‘On the east… the divisions of the camp of Judah are to encamp under their standard… The tribe of Issachar will camp next to them… The tribe of Zebulun will be next. On the south will be the divisions of the camp of Reuben under their standard… The tribe of Simeon will camp next to them…The tribe of Gad will be next. On the west will be the divisions of the camp of Ephraim under their standard… The tribe of Manasseh will be next to them… The tribe of Benjamin will be next. Clearly, from the above text, the Lord organised the 12 tribes* of the Hebrew people. Above is a diagram showing this arrangement. This was also the marching order of the 12 tribes: those who camped in the east set out first, followed by the tribes who camped on the south. The Levites who camped in the centre of the who arrangement, & who carried the Tent of meeting & all the holy items set out next. Then the tribes who camped on the west set out, finally the 3 tribes who camped on the north side, set out, as the rear guard. *For the observant amongst you, there are 13 tribes in the diagram, when you count them all up! However, there wasn’t a tribe called “Joseph.” His tribe was represented by his 2 sons, called Ephraim & Manasseh.